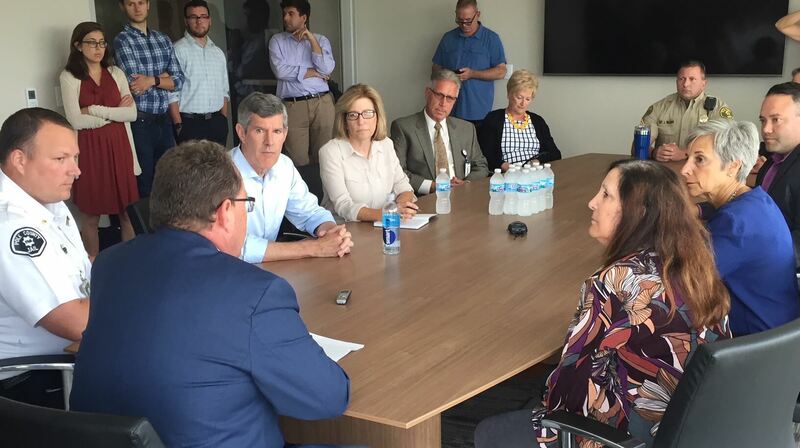 This week candidates Fred Hubbell and running mate Rita Hart conducted a mental health tour across Iowa. Their first stop this week was at Broadlawns Medical Center for a roundtable on mental health needs. Broadlawns proved the perfect kickoff for their tour as this public hospital has become a model for the state in treating mental health patients thanks in part to the Hubbell’s leadership and philanthropy. Broadlawns is achieving exceptional success rates, saving taxpayers money and providing needed services in spite of the failure of the Reynolds Administration to adequately provide leadership or fund mental health needs statewide. Polk County Supervisor Angela Connolly said the county saved $5 million by getting patients “treated out in the field” by trained responders. They achieved that savings by avoiding taking them to jail or seeking emergency services at area hospitals. While Branstad and Reynolds were cutting state funding in 2015 and closing two of the four state mental hospitals, Fred and Charlotte Hubbell donated $100,000 of their personal funds and led the $5 million fundraising efforts to add mental health beds at Broadlawns. Fred Hubbell not only understands Iowa’s mental health and addiction crisis; he is personally invested in fixing it. He assured the Broadlawns’ roundtable of healthcare professionals, law enforcement and elected officials that he understands their needs. “We know what to do to address youth-based mental-health issues as well as mental-health issues for our state. We just need to put the leadership and funding behind it,” said Hubbell. The input from these statewide mental health forums confirms the failure of the Reynolds Administration to adequately prioritize overall state funding, improve critical mental health care, addiction needs and offer a vision for the future. According to the Treatment Advocacy Center under Reynolds, Iowa has plunged to last place in the number of psychiatric beds per capita. Iowa averages just two beds per 100,000 residents compared to a national average of 12 per 100,000. Iowa has fallen from 149 beds statewide just a few years ago to only 64 today. In addition to the lack of psychiatric beds under Reynolds’ tenure, Iowa desperately needs more psychiatrists. Iowa has fallen to 47th in the number of psychiatrists licensed to practice in Iowa. Fred and Charlotte Hubbell not only funded more beds at Broadlawns, they helped fund the addition of two additional psychiatrists at the local hospital. Fred Hubbell doesn’t just talk about improving mental health resources for Iowans, he has made it happen. Reynolds’ Medicaid privatization has further reduced available mental health treatment and availability of beds. The for-profit Managed Care Companies (MCO) have denied services, prolonged approvals, limited treatment and slowed payments to providers. That has forced Iowa hospitals to reduce mental health beds and services. Hubbell has said he will end Reynolds’ destructive privatization scheme and restore essential services to Iowans in need. Reynolds is taking great credit for the Iowa Legislature’s recently-passed mental health bill. The bill offers many of the services that Broadlawns has championed. However, Reynolds and the Republicans refused to fund this legislation. They are leaving it to the counties and the 14 regional centers to find the local funding. Some counties are concerned about running short on reserves. Some are capped out with property tax limits and there is great inequity among the counties. Many regions worry there won’t be sufficient local funding to support the legislation. Hubbell is proposing to end “wasteful corporate tax giveaways” in order to fund needed education needs and mental health services. He said this will provide $160 million to fund essential services for Iowans. Hubbell promises Iowans proven solutions while Reynolds boasts of unfunded mandates on local communities. Very interesting exposure of GOP failure to govern adequitly. There is no doubt more psychiatrists are needed in Iowa and nationwide. But one important issue that is often overlooked is the loss of on-the-job trained mental health workers with a number of years of service. With the closing of the two Iowa mental health facilities these people, very able mental health care givers, are lost to a system needing their compassionate care. Like a Humpty Dumpty story you cannot reassemble the lost pieces. They do not have the privilege of re-locating. They are hourly workers. rates. This subtle form of discrimination must be stopped and patients with these complex brain disorders can be helped with the proper treatment and support. remain one of the worst states for taking care of these broken people. I read the article as looking at # of psychiatric beds as major thrust for a State mental health program. It is the lack of out-patient or mental health clinic locations that should be the initial source of ready consultation; referral and day treatment planning. Neglected services in the out-patient realm leads to deteriorated condition and then the need for emergency hospitalization. One of the best places to start for mental health screening and needs is the schools. School Psychologists see the child and parents and can refer those cases in need to other locations or be the source of consultation remediating the child and family crisis and or dysfunction. The current level of psychological services in the schools by either full time school psychologists or outside psychologist providing consultation/evaluation is totally and grossly under staffed.